QuadraNet, Inc. is pleased to announce the addition of Rafael Oganesyan to their management team with his recent appointment as Support Manager. QuadraNet, Inc. is pleased to announce the addition of Rafael Oganesyan to their management team with his recent appointment as Support Manager. Mr. Oganesyan will oversee the responsibilities required to continue the company’s goal of continuous improvement to client experience and technical support. 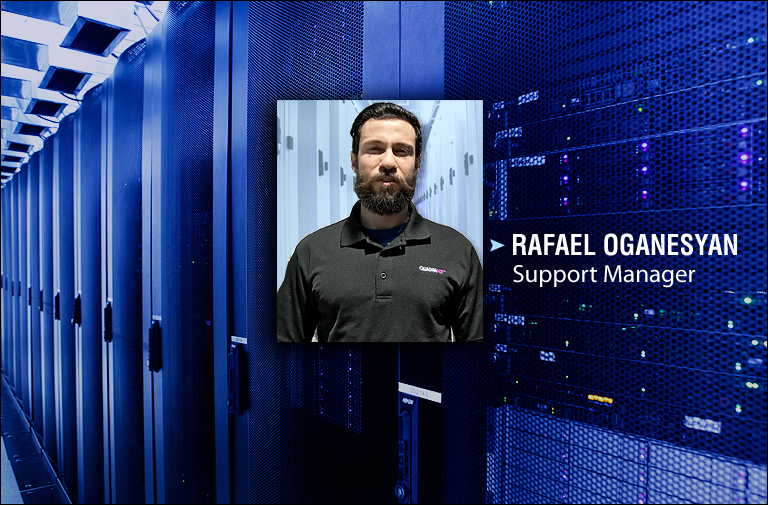 With a wealth of industry experience in the datacenter space that spans many years, Rafael brings with him a strong track record of delivering expectations and a vast understanding of the critical ins and outs required for effective systems administration. “Rafael has demonstrated a great amount of knowledge when it comes to team leadership, datacenter management and systems administration. While already a valuable addition to our staff, he will be in a position to improve his positive impact by being part of our management team,” said QuadraNet founder and CEO, Ilan Mishan. As Support Manager, he will enhance policies and make meaningful contributions to assure QuadraNet’s support department continues to run at the highest level of efficiency, effectiveness, and delivers the best quality of support to clients at all times. QuadraNet Inc., since 2001, has been a leader in hosting and data center solutions as a telecommunications provider in Los Angeles and the surrounding areas. QuadraNet has grown to become one of the largest providers of dedicated servers, colocation, cloud hosting, and bandwidth services. In addition to Los Angeles, QuadraNet has expanded to offer services in Dallas, TX, Miami, FL, Atlanta, GA, Chicago, IL, and Secaucus, New Jersey. With a team of highly-skilled professionals that are passionate and excel at designing and implementing the perfect solution for clients and their businesses, QuadraNet has a chief focus on providing consistent and exceptional service and support. Facilities and services are staff and monitored 24×7 to assist with everything from routine memory upgrades to advanced systems troubleshooting.